It’s time to change the way urban customers pay for water. One way to do that is to divide bills into two parts. One part would cover the cost of providing the water and the other would be a value assigned based on the scarcity of water at that time, which would incentivize conservation. During dry years, water becomes scarcer, and, economically, people should pay more for it. But most urban residents do not pay directly for water scarcity. We only pay the financial cost of providing water through pipes, pumping, treatment plants and reservoirs. We do not pay for the lost value that water would have had for environmental or agricultural uses outside our communities or the value of that water to other water users in our community. One idea to improve conservation incentives for urban water users, consistent with Proposition 218, is to have a two-part water bill. The first part of the bill would cover the financial cost of water service (pipes, pumping, treatment, water acquisition and other utility operations) and the second part would include the scarcity value of water used. The water scarcity (second) part of the bill could be set using an internal water market. Here, each customer could have a fixed share of the water available to the community or water utility, which could be sold or bought by each customer depending on their amount of water conservation. The share could be set by any of various methods. This approach can provide equity, incentives for conservation and flexibility to accommodate the many different types of households and customers in urban areas. You are paid if you use less than your share and pay more if you use more than your share. Your bill has two parts. The first part of the bill is your share of the cost of water utility operations (piping, pumping, water treatment and acquiring the community’s water supply). This utility financial cost must comply with the provisions of Proposition 218. 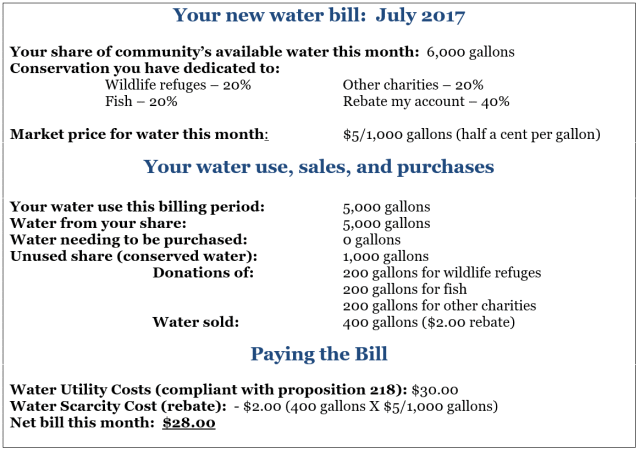 The second part of the bill is for water you buy or sell from others’ shares of the community’s resource, including revenues you made from sharing your lower water use with others in the community. Pricing includes opportunity cost, and not just utility financial cost. The customer’s cost of water now includes its opportunity cost of the water to customers and can better include some of the opportunity cost of water use to the environment. Water utility and customers learn customers’ actual willingness to pay for additional water. If acquiring additional water costs more than customers are willing to pay, then perhaps expansion is less attractive than the remaining scarcity cost to customers. In a dry place like California, some scarcity is economical and good. The cost of eliminating all scarcity is likely to exceed its value. This value information supports better balance and integration across the portfolio of water supply and demand management actions. A main challenge is that this is a new approach, making it hard for many to understand. Another challenge would be selecting a method of allocating shares of a community’s available water. Allocations could be similar to the “water budget” rates common in some California districts, allocated equally among all service connections, by a proportion of previous water use, or any other means. Allocation of annual amounts across monthly or seasonal billing periods and among customer classes are some other community implementation decisions. Any means would bring similar conservation incentives, but perform differently in terms of social equity. Allowing customers to “bank” some conserved water from month to month might be useful. Soliciting customers’ selling prices for conserved water also is a challenge, perhaps with a default pricing policy set by the utility. There would be many implementation issues, but the idea seems worth considering and some are already considering it. This story first appeared on the California Water Blog, published by U.C. Davis’ Center for Watershed Sciences. The views expressed in this article belong to the author and do not necessarily reflect those of Water Deeply.